What's in the Big Book? The Big Book lays out the 12 steps of Alcoholics Anonymous and includes personal stories of those who found recovery in the program. Many recovering alcoholics work the 12 steps with a sponsor. The process includes believing in a power greater than yourself, admitting past mistakes, making amends to people you have harmed through alcoholism and continuing to focus on spiritual growth. Many AA members refer back to the Big Book once they complete the 12-step program and as they work with others on their recovery. What’s in the Big Book? 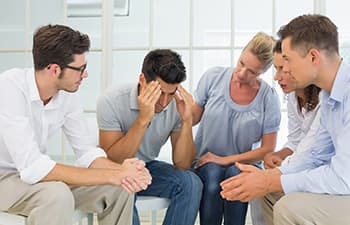 Alcoholics Anonymous is often referred to as a 12-step program, and AA is the basis for many other 12-step programs that have been established. These 12 steps are outlined in Chapter 5, “How It Works,” of the Big Book. The steps helped each of the co-founders of AA in their own recovery from alcoholism and have continued to help countless others battle their addictions. Alcoholics Anonymous members often talk about “working the steps.” During this process, members of the group move through each of the steps to achieve sobriety and recovery. In AA, participants are encouraged to pair up with a sponsor to work through the steps. The sponsor is a member who is further along in the program and acts as a guide through the steps for newer members. The first step outlined in the Big Book is essential to jumpstart the alcoholic’s recovery process. AA firmly believes that individuals cannot overcome alcoholism on their own. They are unable to exercise willpower or personal strength that could prevent them from drinking. Find out more about Step 1. Alcoholics Anonymous is based on the belief in a higher power. For some, this higher power may be God; for others, it may be a belief in the universe itself. The point is that recovery begins, in part, by looking to an entity greater than yourself. Find out more about Step 2. While some entering AA bristle at the mention of God, the end of Step 3 makes it clear that God can come in many forms. Again, the purpose of this step is the further acknowledgement that alcoholics cannot recover on their own. Find out more about Step 3. During this step, many participants make a list of poor decisions or character flaws. They outline hurt they caused to others, as well as feelings, like fear and guilt, that motivated some of their past actions. Once the individual has acknowledged these issues, the issues are less likely to serve as triggers to future alcohol abuse. Find out more about Step 4. As AA members work this step, they sit down with someone – often their sponsor – and confess everything they identified in Step 4. This step requires the recovering individual to put aside their ego and pride to acknowledge shameful past behavior. The step is also empowering, as the alcoholic no longer has to hide behind guilt and lies. Find out more about Step 5. In this step, the recovering alcoholic acknowledges that he or she is ready to have a higher power – again, whatever that may be – take away the moral shortcomings identified in Step 4. This step simply involves a willingness to change. Find out more about Step 6. 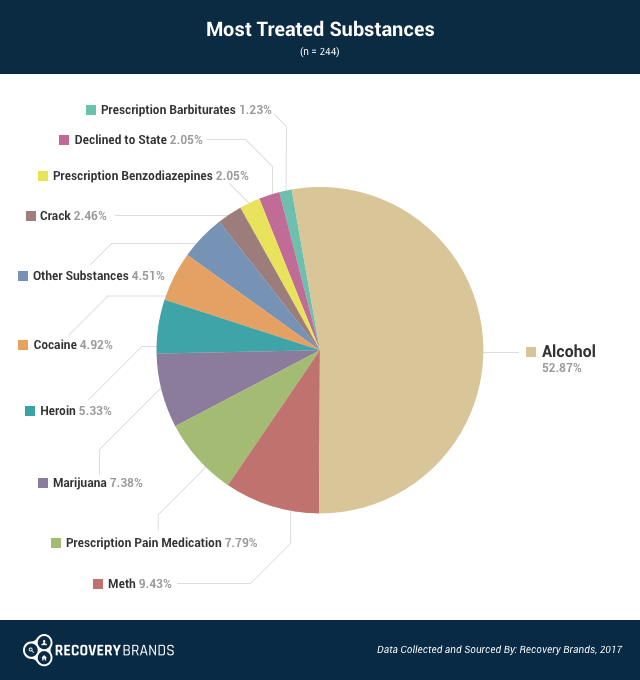 Ethanol, or alcohol, is the most common substance of abuse in treatment, a 2017 survey by Recovery Brands shows. Nearly 70% of people that took the survey got help for an alcohol abuse problem, and nearly 53% of respondents said that alcohol was the substance that they sought the most treatment for. This step requires the person to focus on the positive aspects of his or her character – humility, kindness, compassion and a desire for change – as well as step away from the negative defects that have been identified. Find out more about Step 7. During this step, recovering alcoholics write down a list of all the people they have hurt. Often, this list includes people they hurt during their active alcoholism; however, it may go back further to include anyone they have hurt throughout their entire lives. Find out more about Step 8. Paired with Step 8, Step 9 gives recovering alcoholics the opportunity to make things right with those they have hurt. One’s sponsor can be a big source of help during this process, helping the recovering alcoholic to determine the best way to go about making amends. Find out more about Step 9. Linked to Step 4, this step involves a commitment to continue to keep an eye out for any defects of character. It also involves a commitment to readily admit when one is wrong, reinforcing humility and honesty. Find out more about Step 10. Step 11 commits the recovering alcoholic to continued spiritual progress. For some, this may mean reading scripture every morning. For others, it may mean a daily meditation practice. Alcoholics Anonymous doesn’t have stringent rules on what form spiritual growth takes. It simply involves a commitment to take time to reassess one’s spiritual and mental state. Find out more about Step 11. Step 12: Having had a spiritual awakening as the result of these steps, we tried to carry this message to alcoholics, and to practice these principles in all our affairs. The final step involves helping others and serves as motivation for many to become sponsors themselves. By going through the 12 steps, individuals have a major internal shift and part of that shift is a desire to help others. Find out more about Step 12. Find out more about Alcoholics Anonymous, including what to expect at meetings, how sponsors work, and how to get involved. The Big Book section with personal stories can be particularly helpful to recovering alcoholics. They can read about others who have struggled with alcoholism and effectively recovered. Bill’s Story – One of the founders of AA, Bill, describes his story about how he went from a wealthy Wall Street hustler to broke, how his struggle with alcohol abuse fueled his decline into chaos, and how surrender to a higher power helped him maintain sobriety and help others going through a similar challenge. Doctor Bob’s Nightmare – Another one of the founders of AA, Dr. Bob, recounts his struggle with alcoholism through college and medical school during Prohibition, and how Bill helped him find and maintain sobriety by encouraging spiritual surrender. Women Suffer Too – The story of one of the first women in AA – how her alcohol abuse nearly killed her and how involving herself in AA saved her life, despite her religious hesitancy. Tightrope – A homosexual man’s struggle to walk the line between pretending to be straight and his real sexual desires, all the while using alcohol to cope, until he finally sought the guidance of AA and found a satisfying sober life. Another Chance – An African American woman’s spiral down into extreme alcoholism, sacrificing her family and her livelihood to get her hands on another drink, which lands her in prison for a crime that she cannot remember (due to blacking out) where she finally commits herself to AA and restores her life. The authors outline the 12 traditions in the appendix of the Big Book. These are a complement to the 12 steps and help with operating AA. Alcoholics Anonymous believes that recovery is a lifelong process, so the Big Book is a continual companion in a recovering alcoholic’s life. Recovering alcoholics regularly refer to the Big Book as they progress in recovery, and they use it to help new members as they begin their recovery process. Some people may even work the steps more than once. AA offers a supportive addiction recovery program to those who need it. The only requirement is that a new member has the desire to stop drinking – that’s it. Meetings are free to attend and are held in most cities around the country. The best way to find one is to visit the AA site and locate the central office for your city. You can then either call to learn about meeting locations and times or browse the meeting listings on their site. The backbone of the AA program is that alcoholics need to find a higher power to help them through the recovery process. AA has no rules on religion or spiritually; what a higher power means to each person will vary. AA also stresses that total abstinence is the only means to complete recovery. The program believes that alcoholics cannot moderate their drinking and need to stop altogether. Finally, Alcoholics Anonymous believes that an alcoholic is never cured. Once someone has struggled with alcoholism, they will always be an alcoholic and therefore always need to be in recovery. Many members of AA have been in recovery for decades and continue to attend regular meetings to keep themselves on the path of sustained recovery.
. Alcoholics Anonymous World Services, Inc. (2001). Alcoholics Anonymous: The Story of How Many Thousands of Men and Women Have Recovered From Alcoholism. Tonigan, J. S. & Rice, S. L. (2010). Is it beneficial to have an Alcoholics Anonymous sponsor? Psychology of Addictive Behaviors, 24(3), 397-403.